Firstly let me share you a great tip for the perfect fried rice, use the cold left over rice or refrigerate the cooked rice for 6 hours before using it for fried rice. For sure, you will get the perfect restaurant style fried rice. 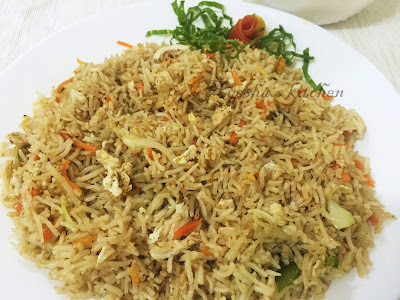 Thai fried rice is a variety fried rice of Thai cuisine and gets its unique flavor from the fish sauce and the oyster sauce which are the main ingredients used in this dish. But I added soy sauce too along with these two sauces and it tastes yummy. This is the classic version and not the spicy Thai fried rice. Heat a wok on a high flame. Meanwhile, season the chicken cubes with pepper and a pinch salt. Add 2 tbsp of oil to the wok and when hot add the chicken cubes. Cook on a high flame until golden and once done keep it aside. In the same wok, cook the eggs until done and set aside. Now add 2 tbsp of oil to the wok and saute onion, garlic, vegetables for 3 minutes. Then add the cooked rice and stir well. Cook for 2 minutes. 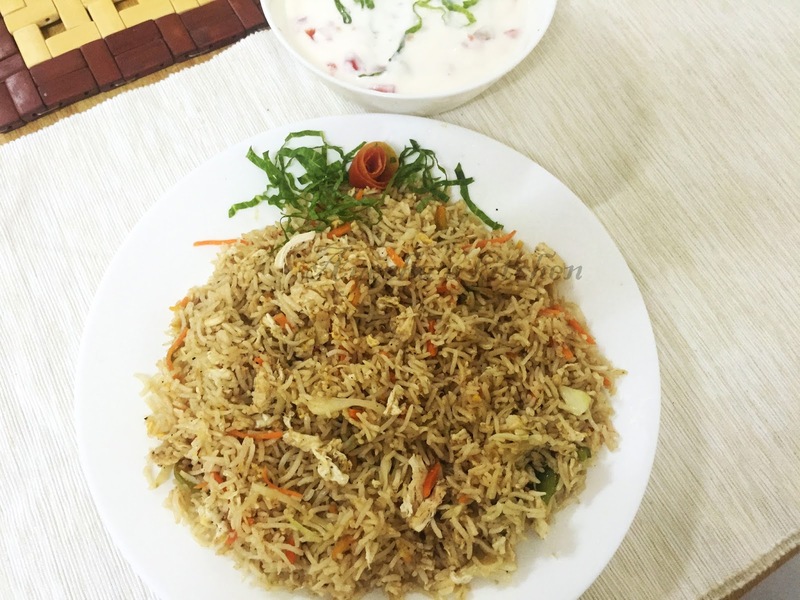 Combine the three sauces in a bowl and add it to the rice and continue stirring for few minutes. Check for salt. Now add the cubed or shredded chicken pieces and egg pieces to it.